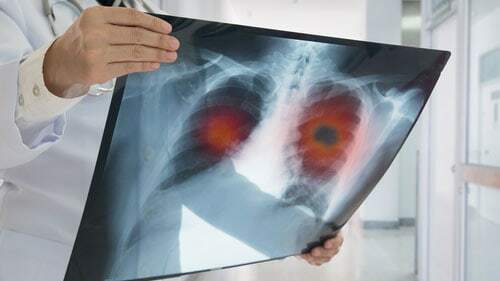 Popcorn Lung (bronchiolitis obliterans) is a devastating condition where the lung's tiniest airways are damaged causing shortness of breath and coughing. It is known to because by chemical (diacetyl) exposure used to flavor popcorn heated in microwaves. However, lung illnesses and exposure to other types of chemicals can also be the cause. The name popcorn lung was derived from factory workers that packaged microwave popcorn who developed bronchiolitis obliterans at a higher rate compared to individuals who did not work there. This was first detected in 2004 when the CDC (Centers for Disease Control and Prevention received reports involving bronchiolitis obliterans in microwave popcorn plant workers in Missouri four years earlier. As a result, many microwave popcorn manufacturers discontinued using the flavoring chemical. However, it is still widely used in the manufacturing of E-cigarette flavors. The National Institute for Occupational Safety and Health investigated the problem and isolated diacetyl (a buttery tasting flavoring agent) as the root cause of developing the illness. Many workers developed shortness of breath, dry cough, and COPD (chronic obstructive pulmonary disease). The federal agency determined that developing the condition was irreversible by using available therapy. Who Is at Risk for Popcorn Lung? Individuals who have suffered a serious illness that affects the lungs can also develop bronchiolitis obliterans (popcorn lung). This includes individual suffering from rheumatoid arthritis or of had a lung transplant where it develops when the body attempts to reject the new organ. Popcorn lung is the leading cause of death in individuals who have undergone a liver transplant. Textile workers and employees at battery factories or at risk for developing popcorn lung. In some cases, popcorn lung is fatal. However, doctors or finding new medications to stop the progression of the condition and treat the associated symptoms. A lawsuit was filed in Colorado by a plaintiff who had developed popcorn lung (bronchiolitis obliterans) after consuming microwave popcorn every day for over a decade. A $7 million settlement was reached in the case because the plaintiff's attorneys proved at the supermarket and popcorn manufacturer should have realized the potential risk of developing lung disease by consuming the microwaveable popcorn. In 2009, another plaintiff filed suit against the food manufacturing company making the claim that he had developed bronchiolitis obliterans after working in the facility for years while inhaling diacetyl used to flavor their frozen biscuits. Unfortunately, the FDA (Food and Drug Administration continues to allow the chemical to be used in flavoring e-cigarette brands. In addition, The Occupational Safety and Health Administration has yet to formally regulate work environments to minimize exposure to the chemical. Instead, they advise workers where protective gear and use respirators when working with the chemical. Most of the symptoms are not immediate when popcorn lung first develops. The symptoms take upwards two weeks or two months before the illness presents itself after exposure to toxic gas. Many of the symptoms occur after rigorous exercise or heavy labor. Individuals who have undergone a lung transplant will display the first signs or symptoms several years after the procedure. Severe cases can produce major inflammaton of mucosal surfaces including the throat, nose, and eyes along with skin inflammation. Nicotine-associated conditions, including those involving electronic cigarettes, can result in asthma. Many of these tests can reveal the lungs are malfunctioning by holding in excessive volumes of air. Usually, the doctor will take a biopsy, a small section of the lung, to closely examine the cells under a microscope. This is usually performed using a long needle inserted into the chest cavity or through a surgical procedure. Popcorn lung (bronchiolitis obliterans) usually causes lifelong damage to lung cells. However, early diagnosis of the condition and effective treatment could possibly slow the progress of the disease from becoming worse. The doctor will determine treatments based on how the condition was acquired. Protective Gear – If the doctor determines that the condition was the result of breathing dangerous chemicals, they will likely recommend providing a barrier by wearing protective gear or maybe suggest changing jobs to avoid additional exposure. Medications – The doctor can prescribe steroids or antibiotics to ease many of the symptoms associated with inflamed scar tissue in the lungs and airways. Immune Boosting Drugs – Certain medications can give a boost to the body's immune system to protect the bronchioles and the lungs from further damage. Oxygen – Breathing and pure oxygen and taking certain prescription medications to minimize coughing, supply more oxygen to the bloodstream and make it far easier to take a deep breath consistently. Lung Transplant – Most cases of popcorn lung are irreversible and necessitate a lung transplant to improve the patient's lifelong jeopardy. However, the patient might be at risk for the recurrence of the disease. This is because popcorn lung is known to chronically reject the new organ in the body. Currently, no federal agency has developed specific standards for exposure to harmful chemicals known to cause popcorn lung.